Forget the World Cup – the Pokémon GO Summer Tour 2018 is this year's most exciting event, and it kicks off in just shy of a fortnight with events taking place in Chicago, Dortmund, and Yokosuka throughout the summer. You can still join in the fun if you can't make it to any of the participating locations though. During specific periods, you and your entire region will be tasked with performing a variety of challenges en masse, and if you complete them as a group, you'll earn a bunch of exciting rewards. In this guide, we'll run you through everything you need to know to about the Pokémon GO Summer Tour 2018, including event times, challenges, and rewards for completing them. The Pokémon GO Summer Tour 2018 is made up of two different parts: location-specific events at Chicago, Dortmund, and Yokosuka, and global challenges that everyone can get involved in. Let's take a quick look at how each of them work. 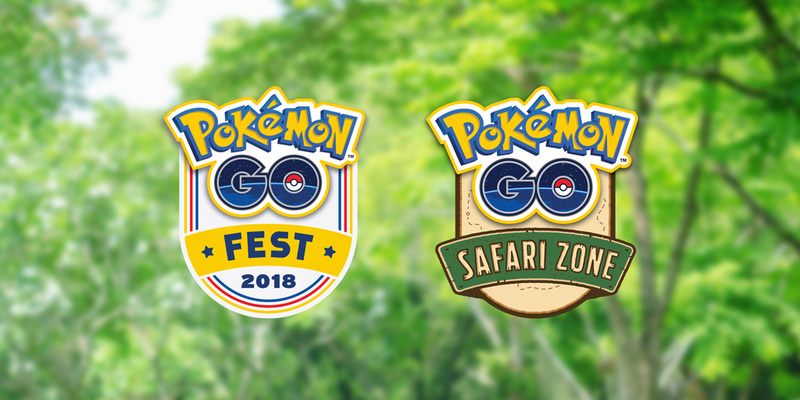 There are two different flavours of location-specific events: the GO Fest 2018 in Chicago, which is kind of an anniversary event for Pokémon GO, and the Dortmund and Yokosuka Safari Zone events. Each event acts pretty similarly, with you and a ton of other Trainers meeting up at specific locations to perform challenges together in exchange for rewards. You'll also often find event-specific PokéStops spewing out exclusive rewards, and rarer Pokémon appearing in those locations for the course of the event. It's worth noting that friendships and trading will likely play a huge part in this year's events, as Niantic has stated that those features will roll out in time for the Dortmund Safari Zone event, which kicks off first on June 30th. The global challenges in Pokémon GO kick off around the same time as the GO Fest and Safari Zone events, and reward players across the globe for working together to complete specific challenges. 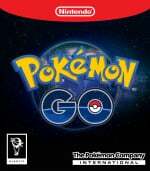 You'll also find increased spawn rates for specific Pokémon, and event-specific Pokémon including shinies, legendaries, and Alolan forms. If a region completes the challenge, which in this case is performing 5,000,000 research tasks as a collective, that reward will then unlock for the globe for a specific period, usually for a week starting the day after the event concludes. There's also a secret bonus reward that unlocks for a single day for each event. 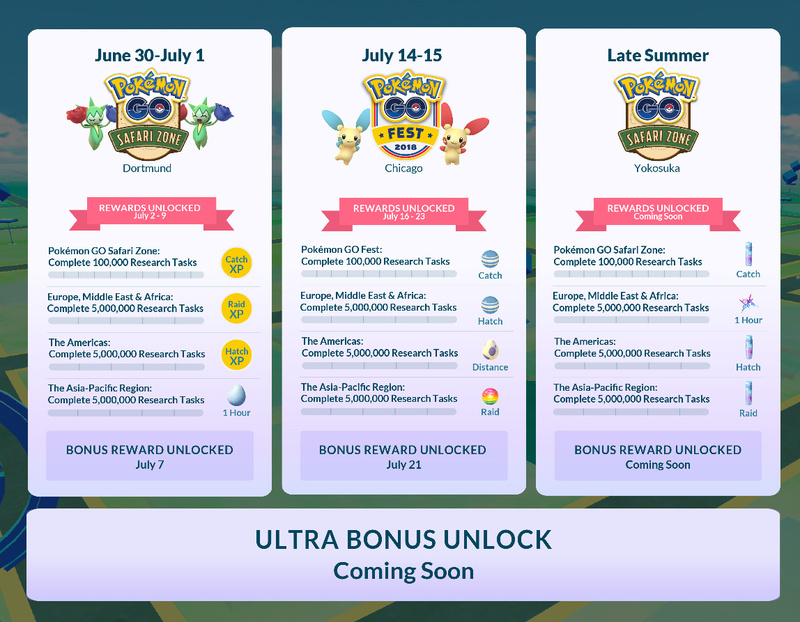 Niantic has released a handy infographic below that details the event in full, including event times, challenges, and rewards per region. We'll go into a little more detail below for each event though, in case you're curious. I'm ready for Alolan Diglett maaaaaaan. I was disappointed with the alolan forms implementation so far. No bonus experience for catching one, no achievement medal to work towards. Nothing. It was just like catching a regular exeggcutor. It seemed lazy to me. Lotad (Ludicolo, actually) happens to be my favorite Pokémon. Hopefully this year they take precautions and prepare their servers for the increased load. This past week during the community day it felt like the servers were just barely able to handle it.